The background is subtle and provides contrast with her hat, clothing and hair. Avoid stark white and black backgrounds. She is posed in a natural pose that is not quite straight-on. Very few people can take attractive straight-on photos. There are no hands in the photo, especially not on her hat. Her make-up accents her eyes and lips, the two areas in which you smile is seen. Her hair is styled but not overly so and is mostly behind her shoulders. She has chosen subtle accessories that match the blouse she is wearing. There is no need for a necklace with this neckline (more often than not a necklace is not needed). The blouse she has chosen is a good color for her, it is pressed and fits. 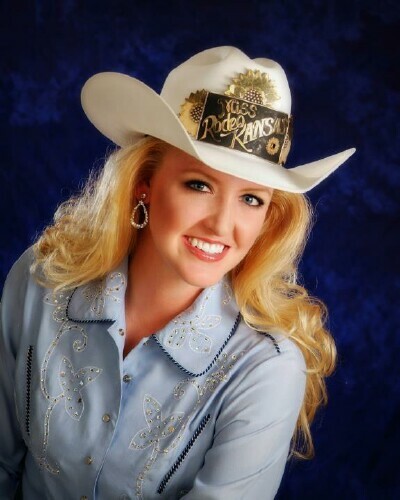 The following photos are of state titleholders who competed for the Miss Rodeo America title. The photogenic judging at the national pageant is not based on photographs provided. A professional photographer takes five photos of each contestant following one of her interviews. Those photos are then judged by an independent judge. These photos are being used as samples to help inspire you to achieve excellence. These three young women did not begin their pageant careers taking excellent photos. Over time and with experience they learned what pose provided the best angle, what color of clothing looked best on them and how to style their hair and make-up. All photos used with permission of the titleholder. The monochromatic color theme keeps this photo neat and clean. This photo is a more of a casual photo with the background style. It is still an excellent photo. No need for a necklace with this stunning neckline. Notice how the earrings match the beading on the neckline.